The head of the international community’s nuclear watchdog organization disclosed Monday that certain agreements reached under the Iran nuclear deal limit inspectors from publicly reporting on potential violations by the Islamic Republic. 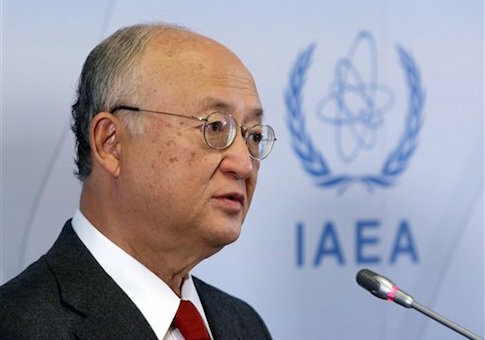 Amano disclosed in response to questions from reporters that the last report was intentionally vague because the nuclear agreement prohibits the IAEA from publishing critical data about Iran’s program that had been disclosed by the agency in the past. "The misunderstanding is that the basis of reporting is different," Amano said. "In the previous reports, the bases were the previous [United Nations] Security Council Resolutions and Board of Governors. But now they are terminated. They are gone." Most U.N. measures pertaining to Iran—including its military buildup and illicit work on nuclear technology—were removed following the nuclear agreement, which essentially rewrote the organization’s overall approach to the country. The IAEA, which operates under the U.N. umbrella, must now follow the new resolutions governing the implementation of the nuclear pact, Amano said. "These two resolutions and the other resolutions of the Security Council and Board are very different," he said. "And as the basis is different, the consequences are different." Amano said that going forward, the agency would only release reports that are consistent with the most recent Security Council resolutions on Iran, meaning that future reports are likely to impact the international community’s ability to determine if Iran is fully complying with its end of the agreement. Last month’s report was viewed as particularly significant because it allowed the nuclear agreement to proceed to its implementation stage. However, the dearth of information in it has angered some experts. The latest report "provides insufficient details on important verification and monitoring issues," Olli Heinonen, the IAEA’s former deputy director general, stated in a policy brief. "The report does not list inventories of nuclear materials and equipment or the status of key sites and facilities," Heinonen said in his analysis, which was published by the Foundation for Defense of Democracies. "Without detailed reporting, the international community cannot be sure that Iran is upholding its commitments under the nuclear deal." The IAEA’s latest report also failed to disclose information about Iran’s stockpiles of low-enriched uranium, which is supposed to be significantly reduced as part of the nuclear deal. Additional information about Iran’s nuclear centrifuges, the machines responsible for enriching uranium, also was withheld by the IAEA. Other critics accused the Obama administration of misleading Congress during negotiations over the deal. White House officials maintained at the time that the agreement would provide increased transparency into Iran’s nuclear endeavors. "When nuclear negotiations began in late 2013, the administration asked Congress to stand down on pressuring the Iranians, and promised to force the Iranians to dismantle significant parts of their nuclear program if Congress gave negotiators space," Omri Ceren, an official with The Israel Project, which works with Congress on the Iran issue, wrote in an analysis sent to reporters on Monday. "U.S. negotiators eventually caved on any demands that would have required the destruction of Iran's uranium infrastructure, and instead went all-in on verification and transparency: Yes, the Iranians would get to keep what they'd built, and yes, their program would eventually be fully legal, but the international community would have full transparency into everything from uranium mining to centrifuge production to enriched stockpiles," Ceren explained. However, "now Amano has revealed that the nuclear deal gutted the ability of journalists and the public to have insight into Iran's nuclear activities," he said. "In critical areas, it's not even clear that the IAEA has been granted the promised access."